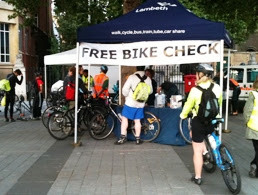 Lambeth Council are running their popular Dr Bike service every Wednesday in September at various locations around the borough. The Dr Bike team can fix basic problems, adjust your bike and offer advice on further action if required. In most cases the Police also attend these sessions to advise on security and offer a security registration and marking service.